The problem is, we have no documentation as to who is who, where the photo was taken etc…! Aunt Bessie’s photo collection is a mess! I’m sure we all have a nice pile of photographs that Aunt Bessie left us and the who, what, where, when and why is a mystery. So I thought I would share some basic information that might get your brain ticking and thinking about your photographs in a new light and maybe some ‘bingo!’ moments will happen! So how can you date photographs? 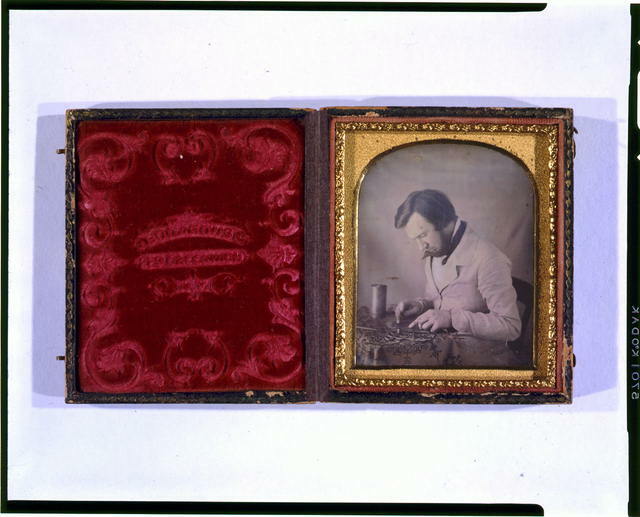 Daguerrotpyes (1840-1855) – The person or their family would have been very affluent to have a daguerrotype made. They are generally housed in a small leather case and lined with velvet. The image is a direct positive made in the camera on a silver plated copper or brass plate. 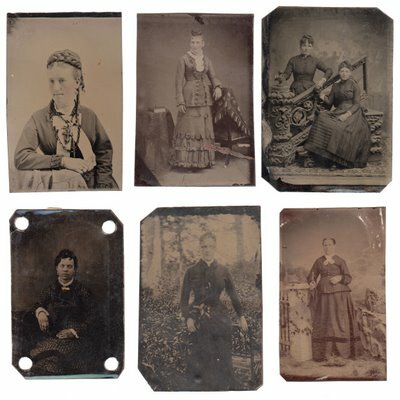 Ambrotypes (1851-1880) – This form was cheaper to produce than dageurrotypes, making photographs more accessible to those not as well off. 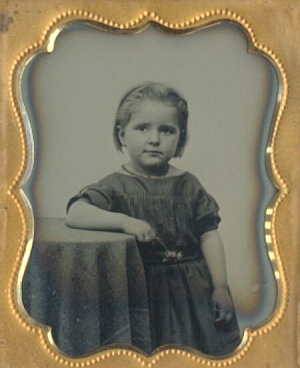 The image is a positive made in the camera on a sheet of glass using the wet plate collodion process. It did not have the shiny metallic surface of the daguerrotype. Tintypes (1860-1918) – Even cheaper than ambrotypes. The base was an iron plate and also used the wet plate collodion process. 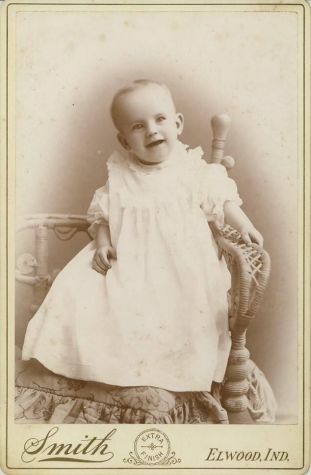 Carte de visite (1860-1899) – Paper picture mounted on card, generally 4″ x 2.5″. On the reverse the photographers details were usually found. 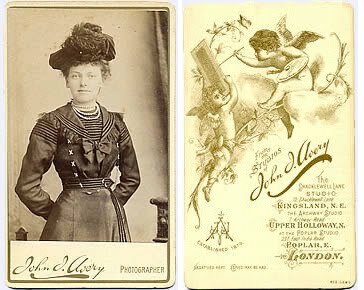 Cabinet cards (1866-1914) – Paper picture mounted on the photographers trade card. 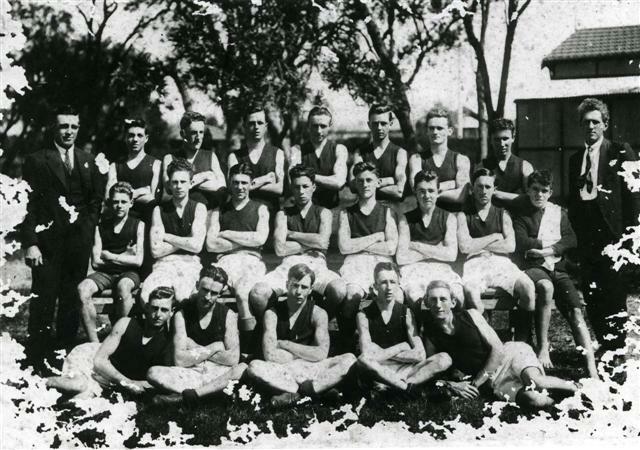 Look at the ‘types’, as above – This may give you an indication of the date range of the photograph. Look at the periphery of the photograph – What is the story behind the photograph? What significant world events may have been happening at the time? Could it have been someones birthday? Is it at a house that you can remember from your childhood? Are there any small clues that could point you towards understanding the bigger picture? Are there any details of the photographer on the photograph? – You can check local telephone directories to work out when the photographers business was operational and this in turn can give your photograph a date range. Look at the styles, conventions and fashions of the photograph – there are lots of photography books that outline what was in vogue and when in photography circles throughout the ages. Check out call no. 770 in the adult non-fiction and local history collections at your library to see if there are any related titles. Get talking with your family members! Who knows what information they might have squirreled away! As you begin to discover information about your photographs you should be recording everything onto a piece of paper or in a word document. Assign your photograph a number (pencil it on the reverse in the top right hand corner) and also put this number onto the document on which you are recording your information. Store all your photographs together and in order and create a file for your documentation (again in order) so you can easily cross reference your photograph with any documentation that you have created and vice versa. In short…if you are going to embark on sorting through Aunt Bessie’s photo collection, think about the bigger picture and plan wisely. It’s not a hard or expensive project to undertake. It just requires some thought, time, patience and dedication. The State Library often have free workshops that are a great starting point for those interested in this kind of thing. Check out http://www.slwa.wa.gov.au or contact heritage@southperth.wa.gov.au for more information. Have you ever thought what you would do if a water pipe burst in your house and managed to get to your treasured photograph collection? Did you know that there are simple steps that you can take to be prepared for any kind of disaster? It can be as simple as identifying all the items in your personal collection and prioritising them in terms of their importance and value….or where and how you store these items in your own home (and there are cheap options out there!). May is the month dedicated to disaster preparedness in heritage collections…this also includes your family heirlooms and treasures you are keeping for future generations! The Local History Collection will be working towards developing a disaster preparedness plan in light of moving into our new home at the South Perth Library.